Long before opioid addiction was declared a national crisis, public media stations across the country were raising awareness of the issue in their communities. As part of gathering of more than 350 public media leaders in Washington, D.C., the Corporation for Public Broadcasting demonstrated the power of public media locally and nationally by highlighting the wide variety of ways public media has addressed addiction. Public media stations in all 50 states have produced local coverage of the opioid crisis, adding up to thousands of hours of broadcast and online content and hundreds of town halls and other events. Locally, regionally and nationally, public media has addressed addiction through documentaries on FRONTLINE and NOVA; statewide public collaborations examining the problem and connecting people with community resources; award-winning coverage by CPB-supported journalism collaborations; and Rock and Recovery, a radio format with upbeat rock music and affirmations created by WAPS-FM in Akron, Ohio, for those in recovery and their loved ones. Harrison shared a preview of the Independent Lens documentary “The Providers,” which explores the relationship between healthcare professionals and their patients in rural Espanola, New Mexico, which has had one of the highest overdose rates in the country. And she awarded the Strengthening Civil Society Thought Leader Award, recognizing American leaders who affirm the essential services public media provides, to Congressman Ben Ray Luján of New Mexico. 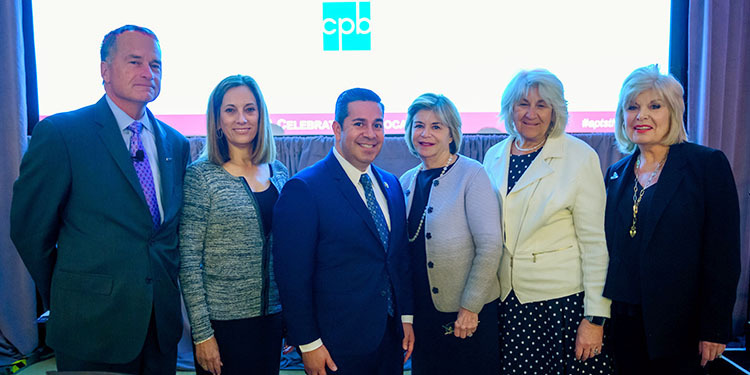 Luján praised public broadcasting for providing thoughtful, in-depth news coverage and for telling the important local stories that helped create a sense of urgency needed to get legislation addressing the opioids crisis across the finish line. Admiral James “Sandy” Winnefeld, who was featured in NOVA’s “Addiction” documentary, talked about the perfect storm of factors causing the opioid crisis and shared the story of his son Jonathan, who died at age 19 of an overdose of fentanyl-laced heroin. His son’s death motivated Winnefeld and his wife, Mary, to start the Stop the Addiction Fatality Epidemic (SAFE) Project, a nonprofit organization to fight opioid problem.